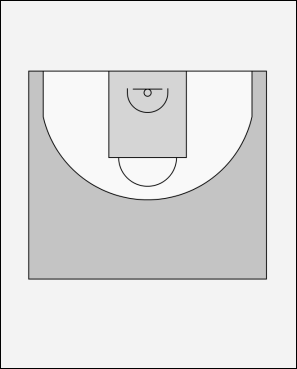 Player 1 sprints and picks up the basketball from the 4 chairs on the court, shooting from alternative positions. After shooting the 4 shots, player 1 then sprints to the 1/2 way line and picks up the basketball, dribbles it to the elbow and shoots, then sprints back to pick the other basketball up and repeating the dribble and shot. Although this drill is a hustle drill, players should look to make their shots.